​Our award-winning professional journal, informally known as TOMT, is published five times a year. 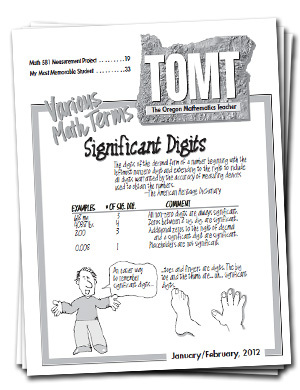 The National Council of Teachers of Mathematics Affiliate Services Committee awarded its Publication Award for Journal to TOMT in 2015. Download a sample TOMT here. OCTM members can receive printed copies or access the journal on this website. TOMT includes information about activities of OCTM and publishes teacher articles and student activities for grades K through 14 and for teacher-education colleges. If you wish to submit an article for consideration for publication in TOMT, please contact co-editors Marie Cramer and Cheri Clausen for information about article guidelines and criteria.